Madrid is a common first stop for visitors to Spain and is ideally located for accessing all of Andalusia's major cities, including Seville. On your trip to Spain, you could spend countless days exploring the historical landmarks and cultural attractions in either of these great cities, but first, you'll need to figure out how to get from one place to the other. Fortunately, there are many ways to travel between Madrid and Seville including buses, trains, airplanes, rental cars, and even taxi services. However, the fastest and most convenient way to travel is to take the high-speed AVE train, which was first established to connect these two major Spanish hubs and has since expanded to provide service to cities across the country. When you start planning your perfect trip to Madrid, consider a day or weekend trip to nearby Seville so you can watch Flamenco dancers perform in the Triana neighborhood, tour the Moorish Almohad Alcázar castle, or visit Christopher Columbus' final resting place at the Seville Cathedral. The quickest and most convenient way to get from Madrid to Seville is by rail, which takes about two hours and 30 minutes. With this method, you could even make the journey as a day trip from Madrid because of how convenient it is to travel by high-speed rail. From the airport, you can take a yellow bus known as the Express Line Atocha Renfe-Aeropuerto shuttle to Atocha railway station in Madrid, where trains will depart almost every hour of the day for Seville Santa Justa station. Once you arrive in Seville, the train station's central location makes it relatively easy to get around to most tourist attractions in the city. Although there are very few drawbacks to taking the train, it is a little more expensive than the buses at approximately 28 euros, you can't bring as much luggage, and the train doesn't allow as much flexibility with your itinerary as other forms of transit. Additionally, while these high-speed trains are rather roomy and don't frequently fill up, you may want to consider booking your train tickets in Spain with Rail Europe in advance to avoid last-minute overbooking. While taking the AVE train is the most popular method of getting between these two Spanish cities, you may want to consider other travel options if your budget or schedule is more flexible or you want to experience a different side of Spain. The 550-kilometer drive from Madrid to Seville takes about five hours and 30 minutes, making the trip considerably longer by car. Additionally, car rental rates in Spain can be rather expensive, especially for foreign drivers or during busy tourist seasons when companies raise their prices. However, with a rental car, you can also make a detour to destinations like Merida or Caceres on the way. If you're looking to save a bit of money on your trip and don't mind spending a few hours waiting in different cities between Madrid and Seville for transfers, taking the bus is the cheapest option available and ranges in price from 22 to 32 Euro. There are regular buses throughout the day between these two cities, but the journey takes upwards of six hours depending on your route. You'll need to search for "Sevilla," the Spanish name for Seville when booking your tickets online at Secorbus, but you can also book in person at the Mendez Alvaro bus station in Madrid. There are regular flights from Madrid to Seville that can be quite cheap if you book them far enough in advance. Flights depart from Madrid Barajas Airport three times a day (morning, afternoon, and late-night) and arrive at Seville San Pablo Airport, where you will need to take a bus to get to the city of Seville. However, plane tickets aboard Iberia Airlines typically cost upward of 117 Euro, and while the flight is only 65 minutes long, wait times for luggage, boarding, and check-in can take upwards of four hours. Whether you're traveling alone and don't necessarily know what to do or you're looking to share a curated experience with your family during your trip to Spain, taking a guided tour of Seville from Madrid provides a great opportunity to see the city in a unique way. Since the AVE high-speed train makes it possible to visit Seville as a day trip, many tour companies now offer tour packages including transport costs, including day trips by train. 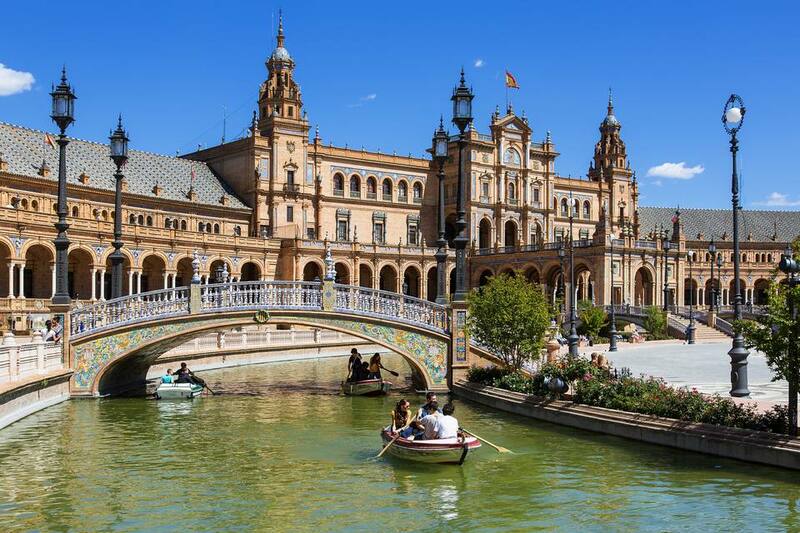 If you're thinking of staying more than one day, consider a multi-day trip from Madrid to Seville and elsewhere, or if you're staying in Seville, an Andalusia tour from there.